A bright and visually very cool print. 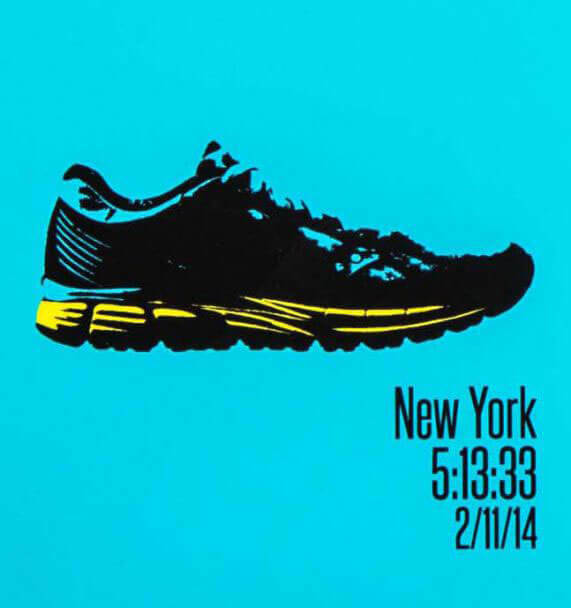 A great print for runners, it is a simple print yet says so much. 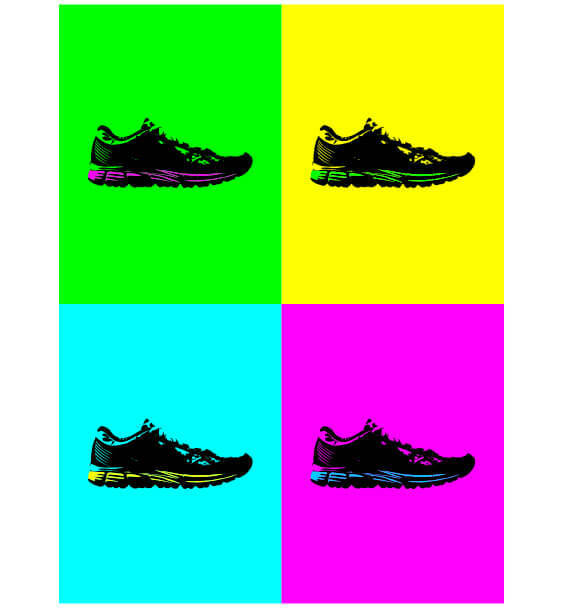 The different coloured bright backgrounds shows up the running shoes really well. 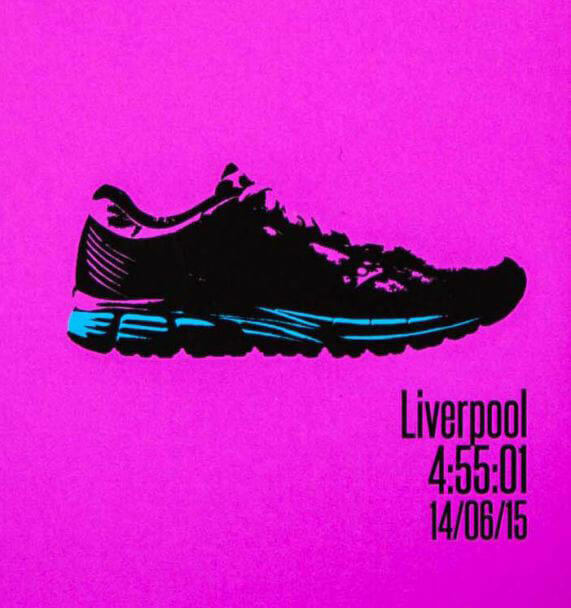 You can have the print with just the running shoes or you can make the print extra special and can add up to 4 customised text that show races with date and time. Add the whole race or just the city. Print does not come framed but does come already mounted so can easily be put in off-the-shelf frames. 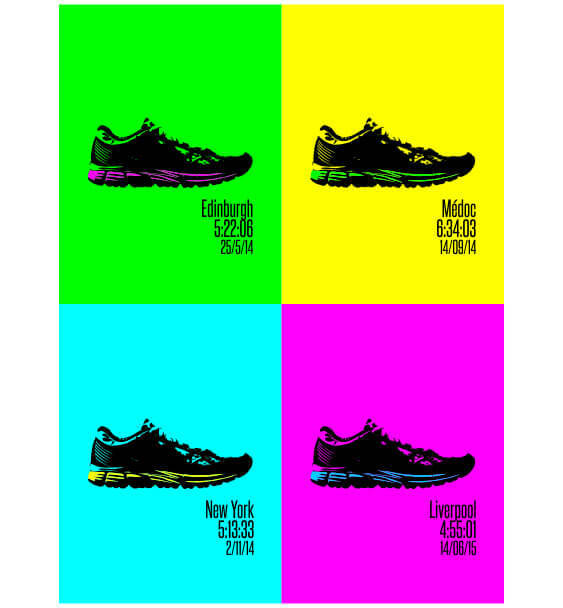 HAVE YOU SEEN OUR OTHER SINGLE POP ART PRINT? Size Choose a size8 x 10"10 x 12"
Prints come already mounted so can easily be put in off-the-shelf frames. 8 x 10", 10 x 12"
All trays are hand moulded so they will vary slightly. - The ordering process is quick and easy. 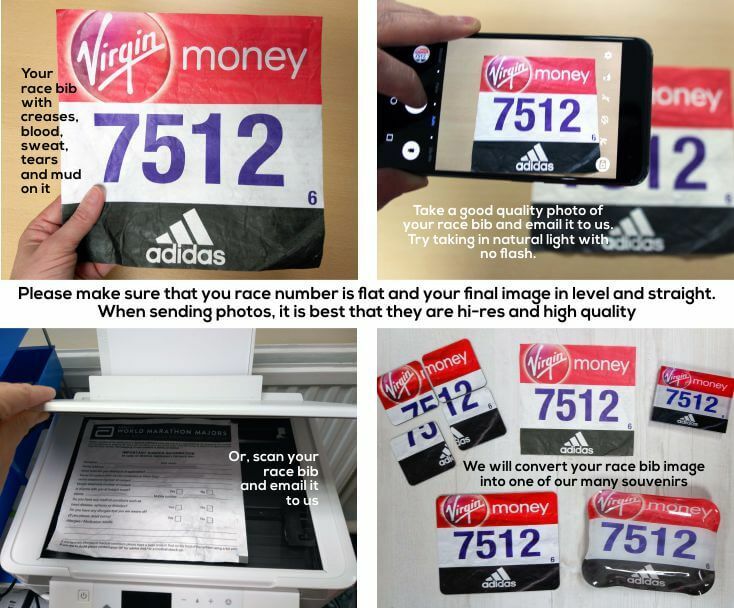 Scan your race number or even take a quick photo from your camera or mobile and email it to us. Please make sure all photos are high resolution, are clear not blurred, taken straight on - not at an angle and without any flash appearing. - Please note, we don't make any changes to the scan you send us so creases, rips, pin holes, blood, sweat and tears etc could be visible on the trays! 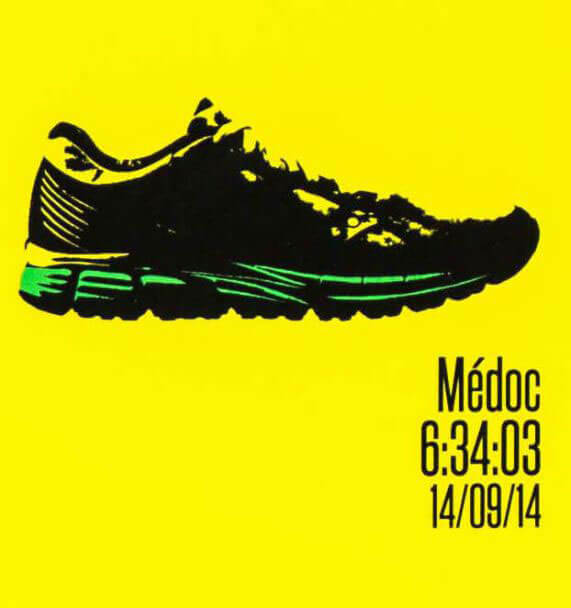 - Some race numbers are rectangular and some are square, so we may have to crop, stretch or squash your race number to fit. 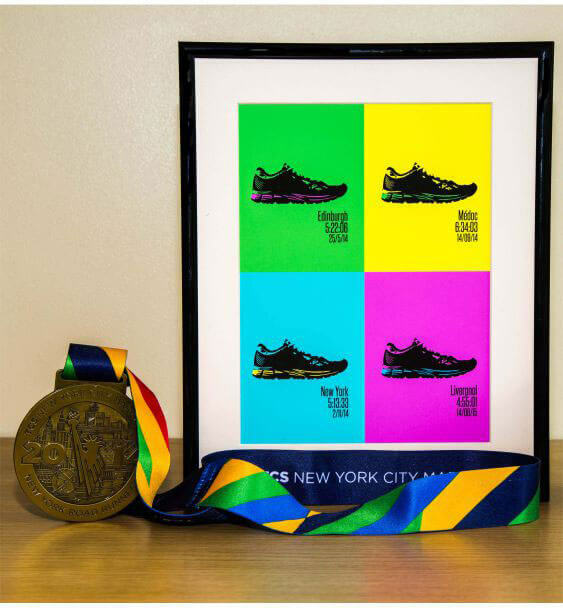 Show off your result from your favourite races on these mugs. 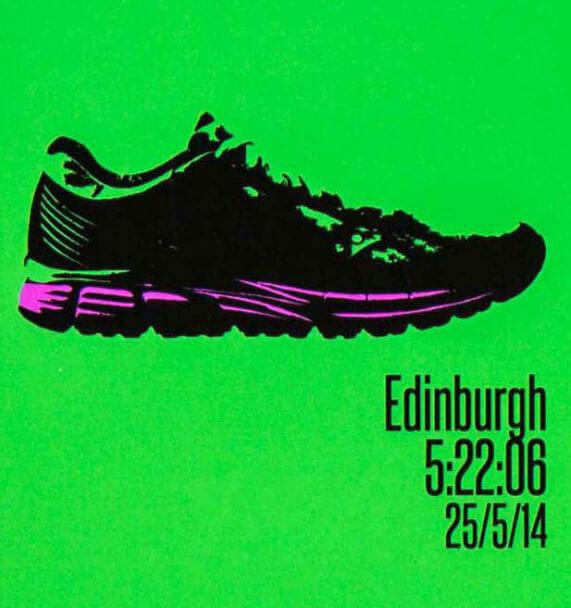 A great way to remember a personal best, first ever race or a landmark achievement. Makes a great souvenir and gift. Finishing any race is an achievement. These fun coasters have the skyline of London on them, with the date, distance and "LONDON MARATHON FINISHER" - just to prove you have done it. Great to put you post race celebration drink on! 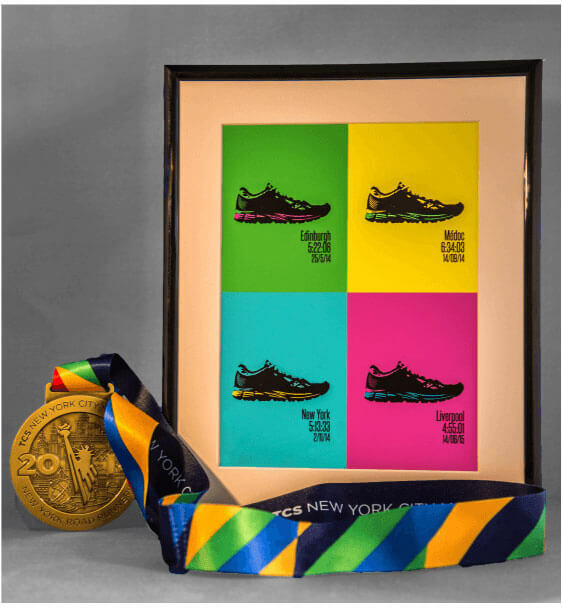 Can be customised with your finish time if you wish. A fun and colourful design. The words RUN all over the tray in different colours and fonts. Just in case you forget what you want to do!